The MFA in Book Arts + Printmaking is a highly selective professional graduate program that imparts a tradition of artistic and academic excellence through a distinctive pedagogical lens individually tailored to each student’s interests and experience. Our unparalleled program offers students a profound conceptual and technical experience as presented through an intense, interactive and rigorous studio environment. The breadth and depth of possibilities exploring the art of the book, printmaking, and the narrative are enormous and complex. 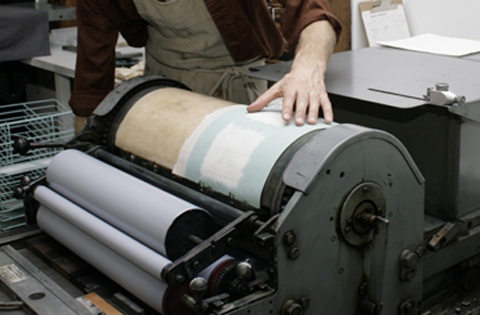 The program encourages students to cultivate a hybrid methodology among the disciplines of printmaking, papermaking, bookbinding and letterpress printing - exploring text as well as image, the temporal as well as the spatial, the three-dimensional as well as the two-dimensional and the traditional as well as the experimental. Courses in the first year intersect, reflecting the integration of skills and concepts, integral to book arts and printmedia. The second year concentrates on the MFA Thesis Exhibition, under the supervision of an advisory committee. Students frequently choose to use their elective credits for internships in professional laboratories and organizations and are welcome as interns in many prestigious conservation labs. Conceptual and technical development in their work. An ability to augment language proficiency on both verbal and written levels. The ability to institute an understanding of printing methods. Students will prepare documentation necessary for being a professional artist. Students will possess an ability to interact and glean artistic maturity from an internationally renowned artist. Students will demonstrate the ability to assume various roles of project leadership among peers. Students will demonstrate the ability to work collaboratively. The program educates students in professional practice skills in printmaking, papermaking and book arts preparing them to succeed in the contemporary art world. Students will demonstrate an understanding of traditional and experimental printmaking techniques. Students will demonstrate an ability to enact an integration between the fine and design arts. Students will have the ability to institute an understanding of digital technology methods. Students will have the ability to institute an understanding of typographic canons. Upon successful completion of the program the student and their work will demonstrate knowledge of the historical and contemporary precedence of the discipline in order to more fully realize a contemporary visual voice. Editions in print, paper and book created by students exhibit technical and conceptual intention. Students will demonstrate an ability to work collaboratively, professionally and constructively in union with artist, faculty, and peers. Students will demonstrate the ability to conduct advanced research. Complete 12 credits of graduate level elective coursework. This requirement is satisfied by 500, 600, or 700 level courses.